The Billionty-Oneth Geek: Afghan Star!! Afghan Star is a documentary that follows four individuals who have made it into the top ten finals of the show under the same name, "Afghan Star". As the name would suggest, the movie takes place in Afghanistan, a country that we don't regularly associate with glitz and glamour as much as we do war and strife. 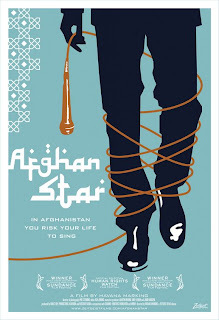 The show is basically Afghanistan's version of "American Idol" here in America. The movie shows us some of the hardships that the contestants have to overcome in order to chase their dreams. But their dreams don't seem much to be rooted in fame. Rather, it's that opportunity to express themselves through an artistic manner that seems most important; a facet that is rare in their culture. This was a powerful movie for me mostly because of my naivety in that I've never thought of the Afghan people in this way. We see and hear about Afghanistan in the news all the time and because of the news, I feel I've been manipulated to think that Afghanistan is a place that's war torn, beaten up and devoid of any joy. In the middle of this blanket image, I've forgotten that there are civilians that live there and feel the same kinds of things that I do... happiness, joy and hope. For many of the young people living in Afghanistan, this TV show was their first experience with democracy. We're told about the different regions within Afghanistan and how there is so much tension within their own walls, but that "Afghan Star" was a way to bring the country together. We see contestants when they are voted off, they hug each other and even though their home regions are at odds, they still respect each other; a great symbolic gesture of unity. Something really interesting with each contestant is how there are campaigns behind them, spreading the word to the public on who they should vote for. We're shown some of the campaign leaders and their activities where in the US, it would be more akin to the campaign for a political party. Another fascinating aspect of the movie was the depiction of women in a non-egalitarian culture. As much controversy that the male contestants have to go through, it's probably the female contestants that must overcome the most adversities. Two of the four singers that we follow are women but both have very different values. One woman, Lema, is more conservative in her values and sings within the rules established by her religious community. The second woman, Setara, is slightly more liberal with her values. When she is finally voted off from the show, for her farewell performance, she performed a dance before she sang. This was condemned by her culture causing her and her family to receive death threats. Her dance became such an outrage in the country that one of the cabinet ministers in their government had to make a public speech, (broadcasted nationwide) to condemn such acts as a threat against their culture and religion. Like I said, a powerful movie. There's so much more in it that I could get into but its truly an experience you must see for yourself. Big thumbs up, if only for the dialogue that such a movie can create. Later geeks!